After the fall of the Roman Empire in the 5th century, a great de-urbanization took place when city dwellers realized that the centralized system was unreliable and even dangerous. Smaller, local bands arose to meet the needs formerly promised by the city. Feudalism was born. As we reach a similar point in the 21st century, it will become more enticing for modern citizens to venture into a similar situation. As many have already found, the city life has more costs than anticipated, and possibly more than the benefits can justify. (Time) “Chicago” Joe Angio and his wife Anna did everything by the book to secure their slice of the American Dream. They earned college degrees, started a small business, bought a house and pair of cars, paid their taxes and credit-card bills on time. But when the economy tanked, so did the dream. Between two jobs they could barely pay their mortgage, reaching a point where they had to choose which creditor to shortchange at the end of the month in order to keep the lights on. With foreclosure no longer a matter of if, but of when, the couple looked on the Internet for the ideal place to lay low, spend less and experiment with solar power to “get more for our buck out of our environment.” They bought a used RV and went off the grid. Way off. 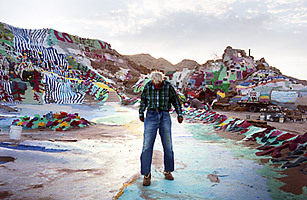 Slab City, their home for the past three months, is a squatters’ camp deep in the badlands of California’s poorest county, where the road ends and the sun reigns, about 190 miles southeast of Los Angeles and hour’s drive from the Mexican border. The vast state-owned property gets its name from the concrete slabs spread out across the desert floor, the last remnants of a World War II–era military base. In the decades since it was decommissioned, dropouts and fugitives of all stripes have swelled its winter population to close to a thousand, though no one’s really counting. These days, their numbers are growing thanks to a modest influx of recession refugees like the Angios, attracted by do-it-yourself, rent-free living beyond the reach of electricity, running water and the law. And while the complexion of the Slabs, as the place is locally known, may be changing in some ways, the same old rule applies: respect your neighbor, or stay the hell away. It might be argued that most of America lives by this same old rule. In most American neighborhoods, the police provide no more motivation to remain civil than they do in Slab City. Civility arises organically when people realize that it benefits them equally. This entry was posted in 2007-08 Crisis, Autarchy, Budget Deficit, Bureaucracy, Capitalism, Closed System, Competition, Current Events, Debt Ceiling, Distributism, Division of Labor, Ecology, Economic Theory, Federal Budget, Free Land, Free Market, Frontier Thesis, Game Theory, Inspiration, Interdependency, Legal Theory, National Debt, Political Theory, Polycentrism, Poverty, Rational Choice Theory, Self-Government, Self-Reliance, Self-Rule, Self-Sufficiency, Simplicity, Solutions, Specialism, Systems Theory, Trade, Wealth, Zero-sum. Bookmark the permalink.